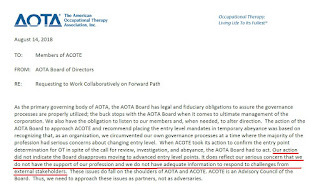 8/24/18: Speaker Debi Hinerfeld indicates that AOTA staff are working "behind the scenes" to guide RA members in their interactions if motions like this are received. Representatives are instructed on how to respond. 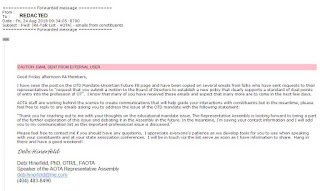 9/10/18 Member sends initial draft motions to RA representatives. 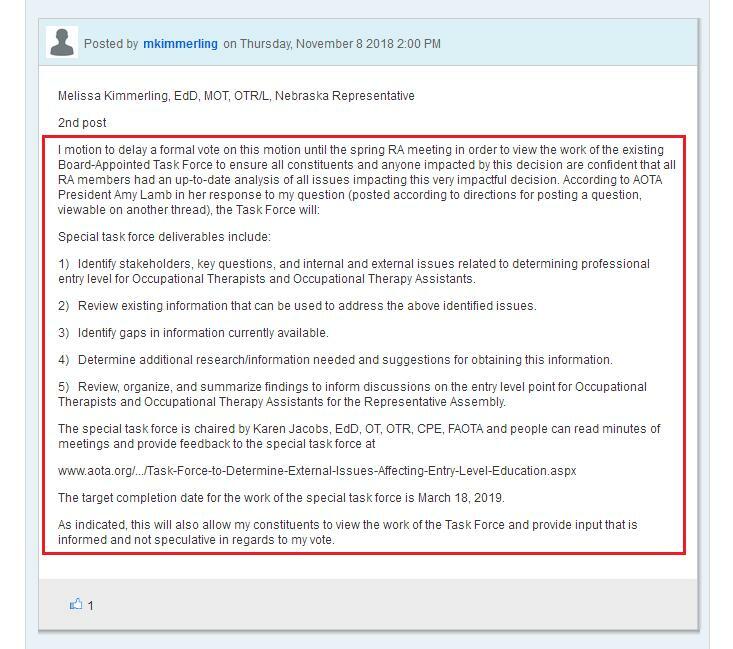 9/12/18 Per Amy Lamb, AOTA Board authorizes task force that is charged to provide information to the RA in advance of the Spring 2019 meeting. 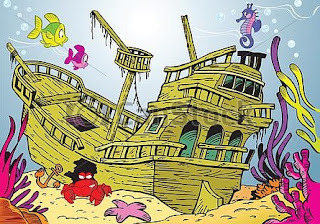 The Board was clearly aware that motions on the entry level were going to be submitted. 9/15/18 Member sends final draft motion on E6 to RA representatives following coordinated review with representatives. 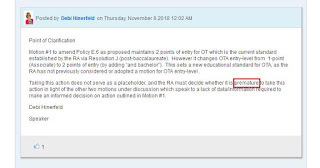 9/19/18 Member sends final motion on E6 to RA representatives for actual submission. 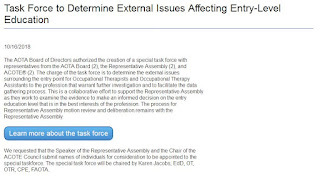 9/24/18 Member receives confirmation of receipt of motions from AOTA staff member Lisa Venus. 10/18/18 Authors of other motions invited to sign onto what became Motion One. All agreed. 10/23/18 Special Task Force on Entry Level meets and accepts charge to deliver results for Spring meeting. 10/25/18 Agenda and timeline for RA meeting published. 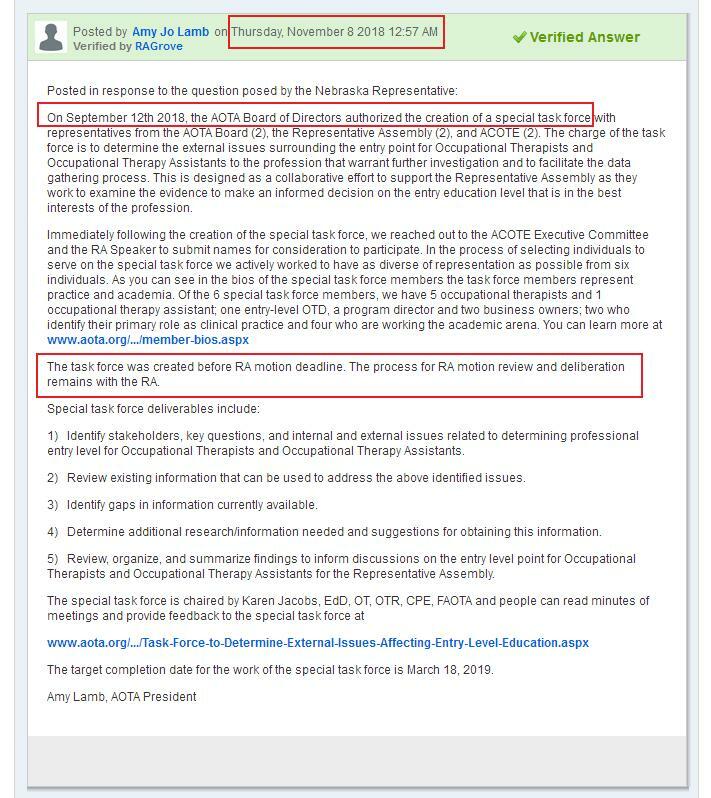 By this time, the AOTA BoD already created the task force in anticipation of the motions and set a Spring 2019 deliverable date. 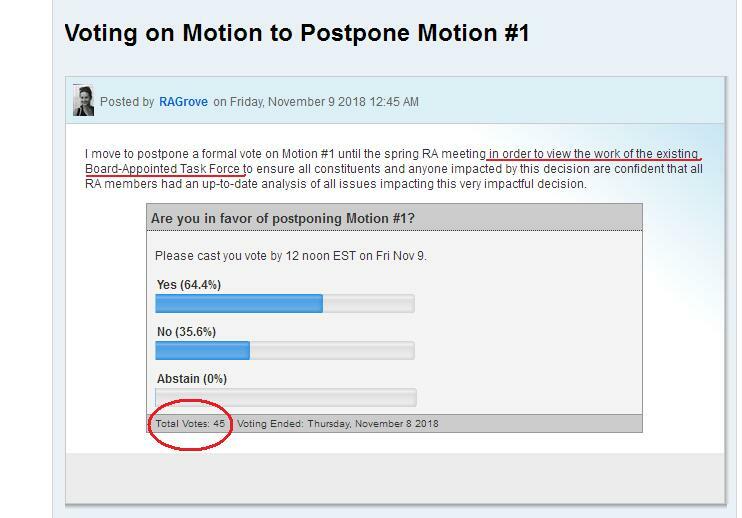 10/26/18 AOTA Board met and reviewed other (unrelated) motions submitted related to posting meeting minutes that did not make it onto the RA agenda. Again, they were clearly aware of motions that were submitted. 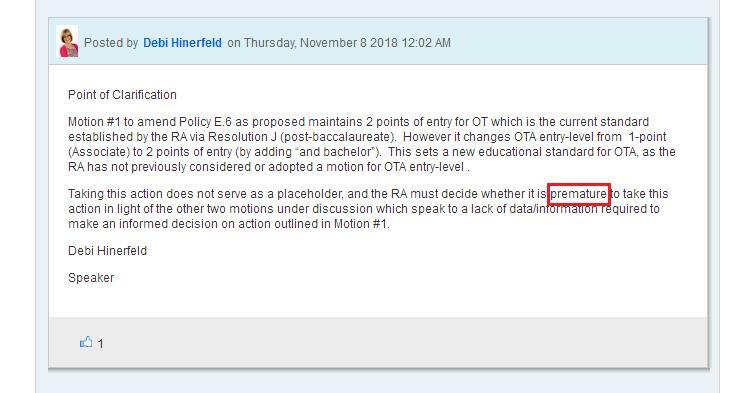 11/8/18 The RA Speaker, who has participated in setting the agenda and coordinated with AOTA staff on directing representatives on how to respond to motions, sets a narrative for Motion One. and then with only 2/3 of the Representative Assembly even bothering to vote, Motion One gets killed. 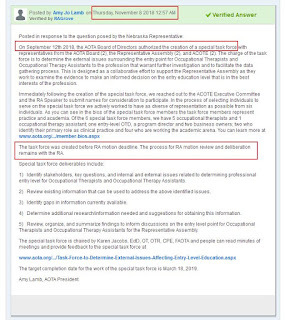 And as was the AOTA plan from the start (see first photo above), now we have a special task force that will collect data so that they have a better basis for enacting a mandatory entry level doctorate. 1. 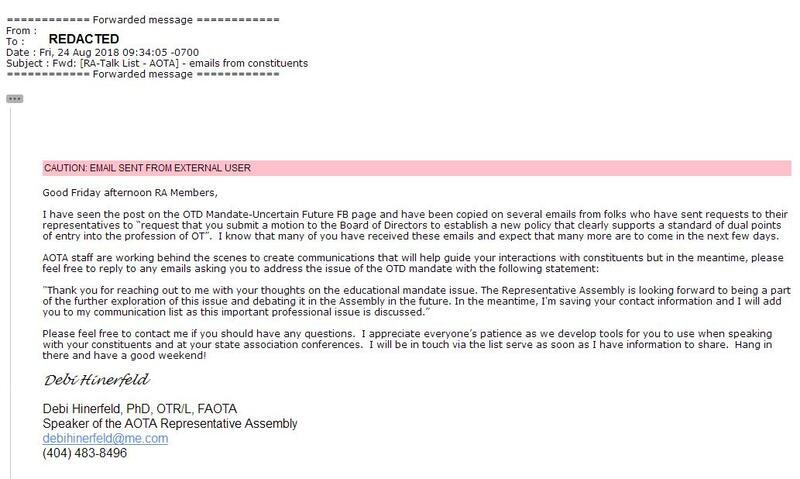 Is it proper for AOTA staff to be working "behind the scenes" to dictate the responses of RA representatives? 2. 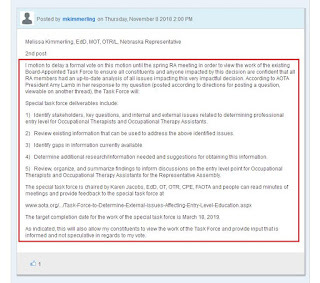 With the direct knowledge that AOTA members were about to submit motions about the entry point, the AOTA BoD formed a special task force whose charge it was to collect data for the Spring 2019 meeting. 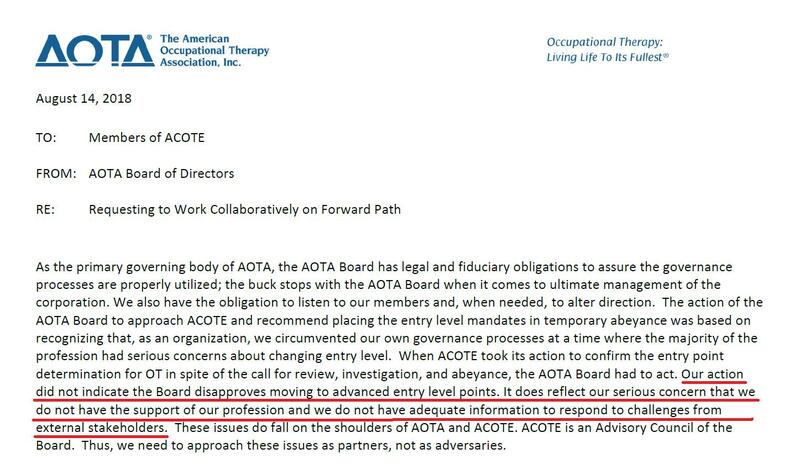 In simple terms, did the AOTA BoD again usurp the role of the RA before they ever met? 3. When the RA discussed Motion One - the primary justification to shut down the motion was to not interfere with the task force that was formed by the BoD because it would be "premature." 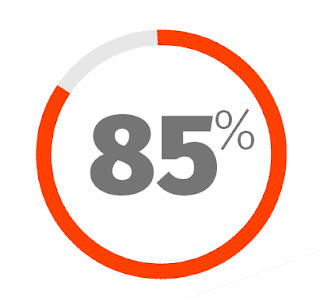 Was setting that narrative frame a correct role for the Speaker? 4. Will this profession ever do anything about the fact that so many elected members of the Representative Assembly don't even bother to participate in the meetings? It is a problem that has been documented for a long time. 5. 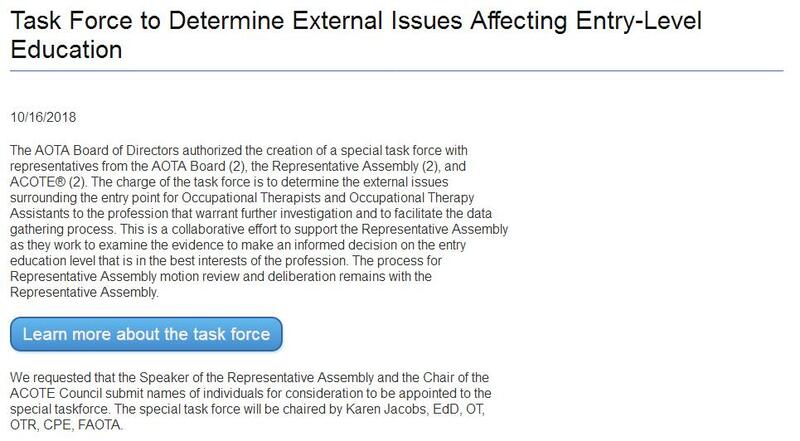 The RA has just been played by the AOTA BoD. How many members have read all of this information and understand?